Health 9 Edition It’s current, it’s accurate, it’s user-friendly, and it’s FUN! 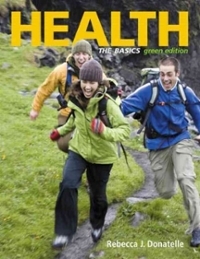 With an emphasis on environmental responsibility, the new Health: The Basics, Green Edition features compelling graphics and relatable content that bring health topics to life, keeping you hooked on learning and living well. Now enhanced with an even more comprehensive package of student support materials, this edition makes learning personal health easier than ever. The Green Edition includes an environmental feature; new mini-chapters; a brand new art program with a new, lively design; and additional content on behavior change; in addition to a robust and expanded supplements package.